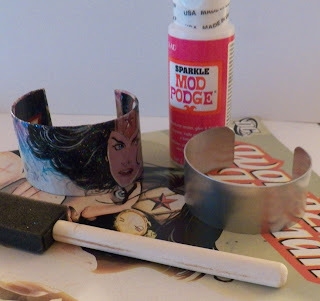 I love Mod Podge® in a big, crafty fangirl kind of way. So when Plaid sent me one of their starter packs with 5 2 ounce bottles- just YAY! 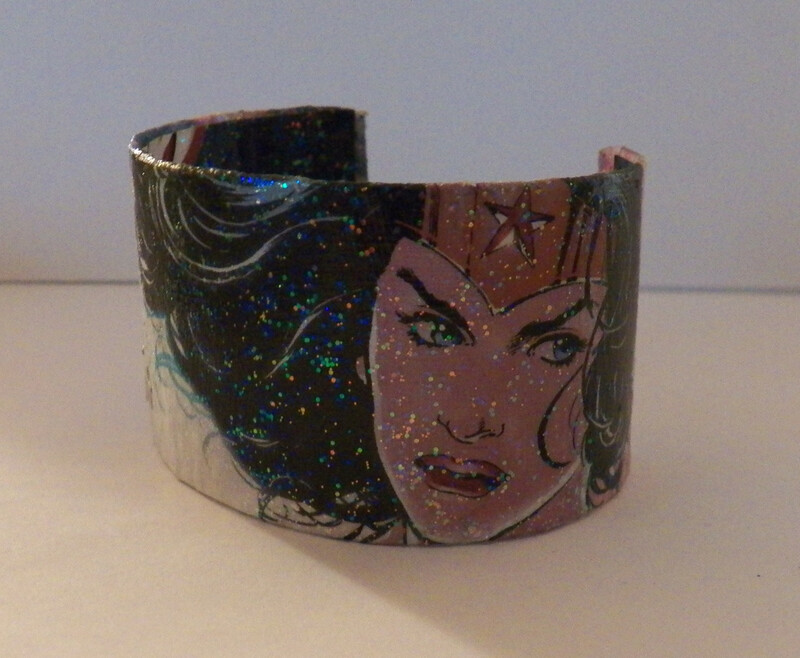 ModPodge also works on metal! You can get a variety of cuff blanks here. The size above is 1.5 inches wide by 6 inches long, and that's the size template I made. ModPodge- I used Sparkle because I'm a magpie. *Comic books- Please don't use older comics without checking them in Overstreet Comic Book Price Guide first. My local comic book shop has a box of 25¢ comics which aren't valuable, plus I have a collection of damaged comics. There are also frequently "introductory" comics that are released for 25¢-1.00 each. 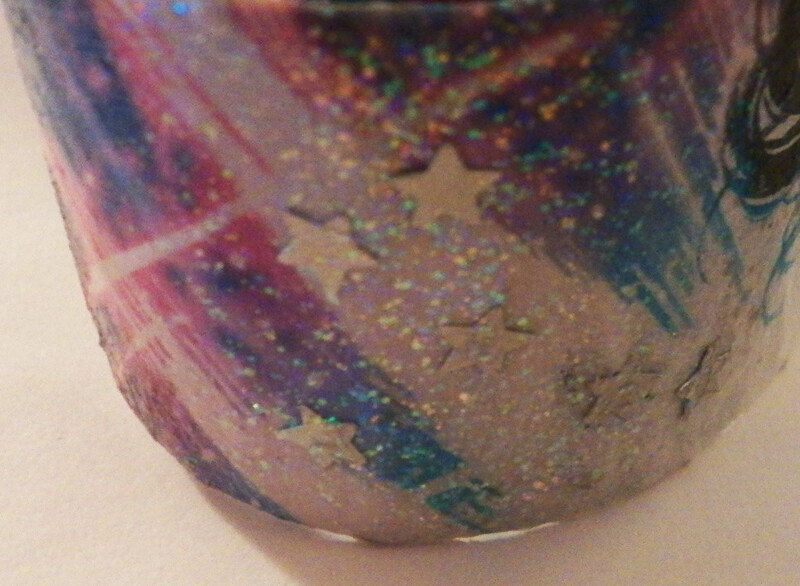 Wash your hands and use rubbing alcohol to remove any oils from your fingerprints on the bracelet blank. It's a good habit to be in whenever you are using adhesives with metal. Set the bracelet blank aside. You'll need two pieces from your comic book, one for the outside, one for the inside. The outside piece is cut a bit larger than the bracelet blank. Print this template. (click the image for the larger version, print at 8x10 inches or to fit page) on card stock, cut it in half on the dotted line. For the top half, pierce the center of the rectangle with your scissors and cut it out to leave a window. 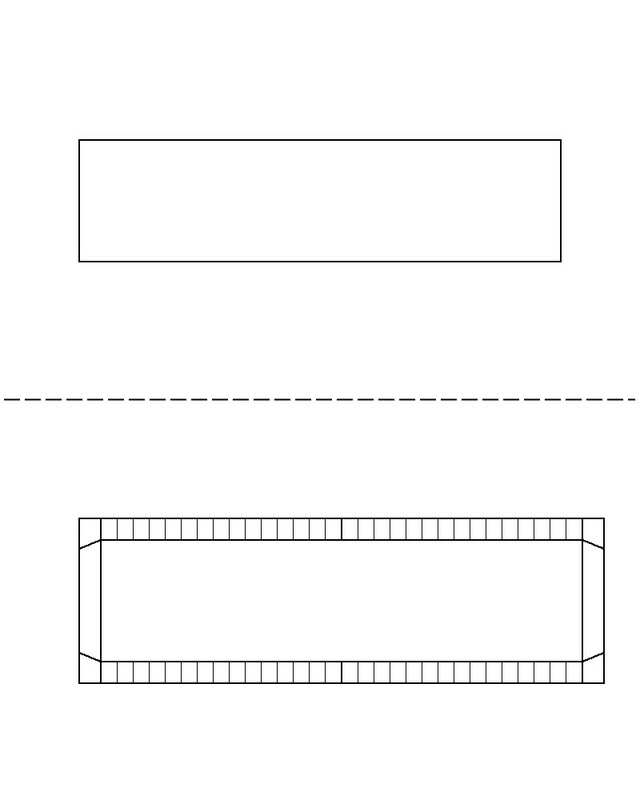 For the bottom half, cut the outline of the large rectangle. The top part is your window for picking the page you want to use for the outside of the bracelet and the template for cutting the inside. 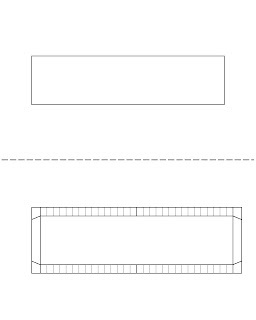 The bottom is the pattern for cutting the outside bracelet piece. Use the window piece to frame pages of the comic book until you find the image you want. You can angle it anyway you want. When you decide which image you want to cut out, lay the pattern from the bottom over the image, trace it, then cut it out. Cut the corner notches off and fringe the top and bottom 1/4 inch deep and approximately 1/4 inch apart. Put a small puddle of Mod Podge on the plate to work with, always use just a bit at a time adding more as you need it. Use the foam brush to spread Mod Podge on your bracelet blank, then starting from the center of you image, apply the image to the outside of the bracelet. Then apply Mod Podge to the inner edges of the bracelet blank. Fold in the sides first to the inside, then fold down the fringes. The reason you fringe it is because the inner diameter is a bit smaller than the outer diameter, the cuts will help it lie smoothly. Let it dry for 20 minutes, then coat the image with Mod Podge. After the outside has dried for 20 minutes, apply another coat of ModPodge. Let that dry, then use the window again to find the inside image. This time, you'll trace the window on the page, and cut it out. 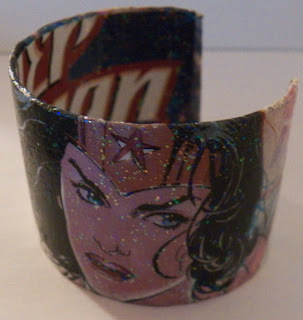 Apply Mod Podge inside the bracelet, then put the image in, starting from the middle and smoothing out. Allow to dry for 20 minutes, then coat with Mod Podge. After the inside has dried for 20 minutes, apply another coat of Mod Podge. For more durability you can spray on a coat of acrylic clear sealer after it's cured. I also used the Mod Podge to apply tiny aluminum stars on the outside. They were cut using a star punch from an aluminum can. I added 3 coats of Mod Podge over them to make sure they were well adhered. A note: A least one a month, someone tells me about recipes for homemade Mod Podge. I've never tried it, and the reason is because I KNOW Mod Podge works. There are pieces my mom made 35 years ago that are still in great shape, and things I did 20 years ago that still look good. No peeling, no yellowing, and they wipe clean with a swipe of a damp rag. People, and Family about your site ! What an Inspiration to see that Comic Book Bracelet ! projects with MOD Podge !! AWESOME SITE ! Keep Rock'n that Great Imagination!!!! What kind of acrylic clear sealer would you use? I'm new to this type of project. My 8 year is a comic book junky shes going to love these. I'm going to give them to her for bday. Thanks for the idea. This would also work for: map bracelet, from your vacation; ticket stubs, from movie, concerts, etc; or wedding program. Or would the heavier paper be a problem? I think for heavier paper, you'd want to wrap the blank in a decorative paper, then apply the heavier pieces as paper appliques to the surface because they wouldn't wrap the edges of the blank as neatly.